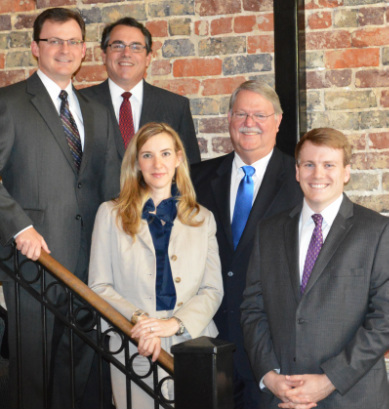 Located in the historic Gilbreath Building in downtown Birmingham, the law firm of Benton & Centeno handles business litigation matters in all courts, with emphasis on bankruptcy and construction cases. "It's company versus company litigation," explains founding partner Lee Benton, a graduate of Auburn University and Cumberland School of Law. "It's about the sanctity of the contract, how strong the contract is, and who stands behind it. The challenge is that there's no true plaintiff or defendant because, inevitably, there's a counterclaim involved where both businesses feel like they are right. It revolves around economics rather than emotions." Brent Morris, a graduate of the University of Montevallo and the University of Alabama School of Law, joined the firm as an associate in 2001 and became a partner in January 2005. His experience includes representing businesses and business owners in all all types of business and commercial disputes, representing debtors and creditors in litigation and bankruptcy matters, representing Chapter 7 bankruptcy trustees, and representing individuals and businesses in civil trials and appeals in state and federal courts. The partners at Benton & Centeno view the practice of law as a profession, not a trade. They are members of the American Bar Association, the Alabama State Bar, and the Birmingham Bar Association, and they have all served on various committees of the Birmingham Bar Association. Benton and Centeno have been listed as Martindale Hubbell "Preeminent Lawyers" since 2000. Centeno has served as Chairman and Co-Chairman on the Grievance Committee of the Birmingham Bar Association and served as Co-Chair of the Alabama Committee on Rules of Professional Conduct. Benton has served as President of the Birmingham Bar Association, Chairman of the Bankruptcy/Commercial Law Section of the Alabama State Bar, two years as treasurer of the Birmingham Bar Foundation, and on the Executive Committee of the Birmingham Bar Foundation. He is a Life Fellow of the American Bar Foundation. They are also active in area churches and have been involved with various community organizations, including Big Brothers/Big Sisters of Alabama, Alabama Goodwill Industries, Birmingham Downtown YMCA, Habitat for Humanity and Attorney's Insurance Mutual of Alabama. Beginning in about 2008, because of the economic downturn, the Firm's practice shifted from one of almost exclusively litigation to one with a larger emphasis on bankruptcy and work outs. To the extent possible, the Firm seeks to avoid bankruptcy for clients facing financial difficulties through realistic negotiations with lenders and creditors. Litigation, even bankruptcy, may be included, but usually only if negotiations fail. While representing many companies, our role has evolved into consultant and negotiator as much as litigation counsel. Benton & Centeno is listed in Martindale Hubbell's Bar Register of Pre-Eminent Lawyers in the areas of Bankruptcy Law, Commercial Litigation, and Construction Law.